Competitive Intelligence is the means by which you can ‘spy’ on your competitors to find out what is working for them that you can model, and what gaps are they leaving that you can fill. This allows you to take advantage of the time and effort they have spent on research – as they aren’t going to be using strategies that don’t work! For example, if they have been running an ad on Google Adwords for a long time then you know the keyword they are bidding on is profitable and ad copy they are using is converting for them. Now don’t feel bad about spying, every single company has a strategy for competitor intelligence gathering, they are investing in competitor intelligence tools and are producing competitor intelligence reports. Competitive market intelligence is what is driving new campaigns, sales funnels and marketing policies. So where do you begin? Our simple guide will get you started. First you need to find out who your competitors are. The simplest way to begin is a basic Google search using the search terms and keywords that you would expect your customers to use to find your business. Note the front page results and whether or not they are paid ads or organic search results. See which domains keep popping up for your searches and rank them based on the number of times that they appear on your results page. Have a look at these sites and see if they are indeed offering similar services and competing for similar customers. If they are not then perhaps the search terms you expect your customers to use to find you have to be revised and more relevant terms found. This list will give you a starting point but know that it will only grow and grow as you discover new competitors and competitors spot you! Now you have identified some competitors you will want to start analyzing them. This is when competitor intelligence tools really come into play. Using a tool such as SimilarWeb will give you a breakdown of where they are getting their traffic from, is it referral, paid search or social? You can also discover what organic keywords they are ranking for and keywords they are bidding on. Importantly, you can see what sites are sending them traffic and where people are going after visiting them, then add them to your competitor list. Step Three – What Are Your Competitors Doing? What ads are they running? What are they promoting? What are they tweeting about? 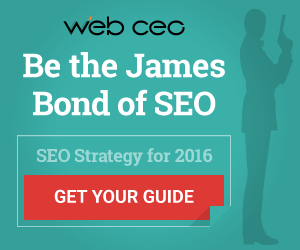 For this you want competitor intelligence tools such as WebCeo, iSponage or SpyFu. Again gather more intelligence, look at what keywords they are getting ranked for or paying for and who they are competing with. Always be adding to your spy file! Using these tools you can look at what campaigns they are running. As a general rule the longer a campaign has been running and the more they are spending on advertising, the more money that campaign is making for them. Look at their ad copy and landing pages. What can you learn from them? Using competitive intelligence you can bypass the trial and error process of a campaign, your competitors have done that for you, and know that if you run a similar campaign, with similar keywords, similar ad copy, similar ad spend and a similar landing page, you are more likely than not to get similar results. Using your competitor intelligence you now have a model of a successful campaign that you can clone and then improve on. You know what products are selling, what landing pages are converting, what ads are driving traffic and what keywords are profitable. So all you have to do it put it all together. Use Google’s Keyword Planner to help gather more keywords and then analyze them further for trends, CPC and keyword difficulty scores using something like SEMRush. Find out what return on investment your competitors are getting from particular keywords and ads using competitor intelligence tools like Keyword Spy. Look at Amazon’s bestseller lists for your niche and see what product descriptions are selling then model them for your products. Using the structure your competitor intelligence report has provided you with, build out your own campaign that will not only rival your competition but smash it! You are now in a game with your competitors to see who can rank highest for keyword terms, get the most traffic and therefore dominate the niche. Everything you have been doing to figure out their campaign strategies, they will do to you, that’s just business. You need to have reporting procedures in place so you can measure your results and monitor your page ranking against your competitors. If you are using something like WebCEO it will do this for you but even if you are doing all the research yourself and using a spreadsheet to record results, you have to keep on top of your data because your competition will be and you don’t want to give them any advantage over you. You need tools. There are many competitor intelligence tools you can use to help you. We’ve just outlined a few that we like and that offer free starter accounts. Our recommendation is that you activate your free accounts today and start familiarizing yourself with some of the tools and their functions. Most of these tools have tutorials that will go into these techniques in much greater detail and show you how to really maximize competitor intelligence. To build an online business you are going to have to learn how these all work and how to use them if you are to have any chance of competing and making serious money for yourself. Click the links on this page or check out our Research Tools for Online Marketers section to get started now!